Harry Hazel, The Joy of Teaching: Effective Strategies for the Classroom (Eugene: Pickwick Publications, 2010). xii + 158 pages. ISBN: 978-1-60608-613-1. Review copy courtesy of Wipf and Stock. Since I read Ken Bain’s book What the Best College Teachers Do, I’ve tried to keep abreast with books on teaching, books which seek to hold up before me the teacher’s task and to encourage me to attend to its craft. Recently, I read The Joy of Teaching: Effective Strategies for the Classroom by Harry Hazel, Professor of Communication Arts at Gonzaga University and author of Art of Talking to Yourself and Others and The Power of Persuasion, and co-author of Communicating Effectively: Linking Thought and Expression. In researching for this book, Hazel collected reactions from over one hundred North American teachers about why they like what they do. Most emphasised the joy of helping students learn and seeing those students develop their potential: ‘Good teachers challenge, cajole, prod, push and move each student as far as they can’ (p. 5). Hazel observes that while good teachers ‘give away’ knowledge, those who find little joy in giving to others will find little joy in teaching. Moreover, great teachers exhibit a passion for their profession which leaves no doubt that they enjoy, at a deep level, what they were doing. They hold learning in high esteem and are committed to ongoing formation and to professional development. excellence in teaching has more to do with an exceptional grasp of the material and clear communication techniques than with popularity. the best teachers demand much of their students. good teachers take time to find out how students in a class learn best, and then adapt. Like Bain, Hazel too notes that there is all the difference in the world whether we are teaching a subject to students or teaching students a subject, and that effective teachers will employ whatever method they believe will best develop an individual student. good teachers respect and love their students: ‘It may seem obvious that liking students is a prerequisite to liking education, but some teachers don’t really like most of their students. They tolerate them because they have to. Once the class is over, they have little contact with them. 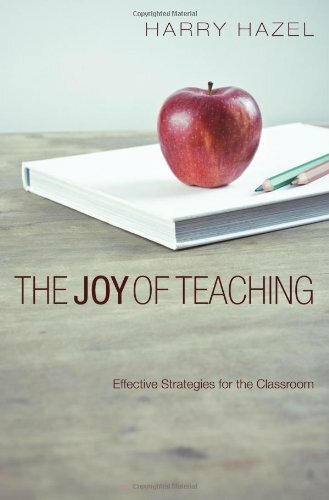 Happy teachers, on the other hand, really like the students they encounter’ (p. 133). While some will find The Joy of Teaching a little anecdote-heavy (a sad trend, it seems, in much recent North American literature), and few engaged with adult-education will find much here that inspires, the book will certainly be read with profit by secondary school teachers and by those who care about what is happening in our high schools. What is important is to understand and communicate basic principles. Teachers must understand the principles. Teachers must know how students think and build from there using the basic principles and logic. Thanks Jason. You do have a great web sight, and all sorts of articles add to the blessing that flows from it. So too, with the simple way you have reviewed this, and so many other books. One thing that strikes me about teaching, is that it is best, when it is deliberately intertwined with the great dimensions of significance; and when it is undertaken, concomitant with the purpose for which all people, and all things are made.